Would you like to keep the proposal a surprise? The very first question you should ask yourself is whether you would like to keep the proposal a surprise. If your answer is yes, but the idea of purchasing a ring without her ring size doesn’t quite sit right with you, Shimansky offers a “stand-in” ring you can use. This will give you the opportunity to get down on one knee without the pressure of purchasing a ring. After the proposal the two of you can visit your nearest Shimansky store and pick the ring out together. 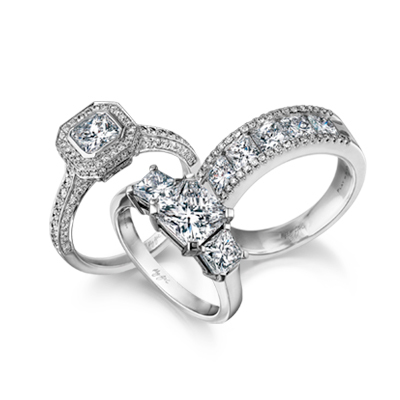 There’s also the option to propose with a Shimansky diamond and you can choose to design the ring together. This way, you will be able to create an engagement ring that’s not only unique to you but also represents your style and taste. Do you know a friend that will be able to go shopping with her? If shopping for a ring together is not an option, and you would still like to keep the proposal a surprise, ask a friend to take her jewellery shopping at any of the Shimansky stores in South Africa. Call the store ahead of the time, and explain to our diamond experts that you would like to get your partner’s ring size and if they could be discrete about it. Make sure, you also ask your future fiancée’s friend to get her to try on engagement rings. This way the Shimansky diamond experts will be able to record the ring size and note the styles of engagement rings she prefers. If your partner becomes suspicious rather opt for the option below. Does your significant other already wear a ring? If the answer is yes, try and borrow it for a day. This way you could give it to one of our diamond experts. They will then be able to use the ring to determine her ring size. If the answer is no, and you won’t be able to borrow the ring, try to trace the ring onto a piece of paper. You could also place it on your finger and take note of where the ring was positioned. Take this information to your nearest Shimansky store where our team will assist in determining her ring size. Is your partner a deep sleeper? If your partner’s a deep sleeper, you might consider yourself lucky. Use this opportunity to measure their ring finger during the night using a piece of string. But be careful not to wake her up. If she’s a light sleeper rather try and ask her friends or family members for her ring size. Hopefully one of them would be able to give you some inside information. You could also try doing these measurements while she’s awake, but she will get suspicious. Getting down on one knee and asking the question is one of life’s most special moments, one that Shimansky will be delighted to guide you on. If the thought of finding her ring finger size is daunting, our team of diamond experts are on hand to give you expert diamond engagement ring buying advice allowing you to give her the proposal she’s always wanted.